This is the fifth of seven guest blog posts about coffee. Baristador Coffee does not necessarily endorse the coffee making methods below, but does endorse Ms Lincoln’s sentiments. Many thanks to Project Gutenberg for making this guest blogging series possible. BUY the cheapest coffee—that is, the kind which costs the least money—without regard to its purity or quality. Use more or less coffee, just as it happens; accurate measurement is not essential. Put it in an old tin coffee-pot; pour on water from the tea-kettle—never mind about the quantity or its temperature, or the time it has been in the kettle, since, as it comes from the tea-kettle, it must be all right. Let it boil indefinitely, and if, when breakfast is ready, the water has boiled away, just pour in more. If you can afford it, add one or two eggs at any time during the process, when you happen to think of it. If it be roily, strain it, if you can find a strainer, and serve it with—yes, common brown sugar and skim milk will do, if you choose to think so. The compound is—what? If there be any left, keep it warm on the back of the stove until the next meal. As this long steeping makes it dark, it must be strong, so, add more water. After dinner set the pot away, and the next morning pour out the old grounds; rinse it or not—just as your time will allow—and repeat the process of making. Wash the coffee-pot occasionally if the outside need it, but rinsing is sufficient for the inside. 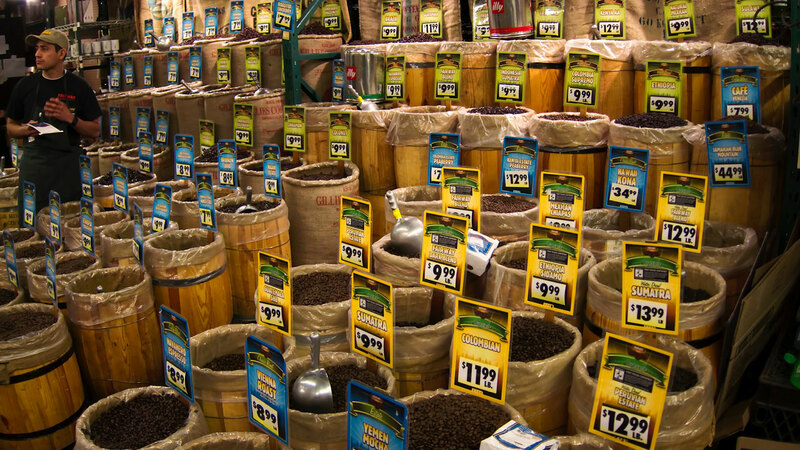 Buy pure coffee—not necessarily that which costs most—but buy it from some reliable dealer. Mixtures of one-third Mocha and two-thirds Java, or half Mocha and half male berry Java, have given general satisfaction. There are some varieties of South American coffee which are very good. Occasionally one finds a brand, through some friend who is in the business, or who has had opportunity of procuring it directly from coffee-growing countries, which is of such remarkable excellence that it leads one to suspect that much of the best coffee grown is not in the market. The raw berries are tough, difficult to grind, and have but little flavor. Roasting makes the berries brittle and crisp, and when properly done develops a fine flavor; but when half done or done to excess, the result is a raw or bitter flavor. 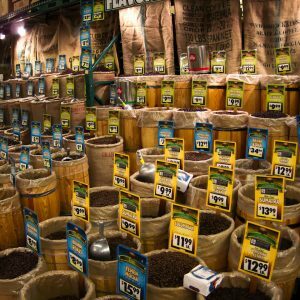 Many prefer to roast and grind the coffee for themselves; but in coffee houses the arrangements for roasting are so complete, that it is better for small families to buy roasted coffee and to grind it as needed, or to buy it ground in a small quantity. It should be kept in air-tight tin cans or glass jars, that the fine flavor may be preserved. Best kind of coffee pot? Opinions vary as to the best kind of coffee-pot. Some prefer porcelain or granite ware, others prefer tin, but all good housekeepers agree that absolute cleanliness is of the utmost importance. The pot should be cleansed every time it is used—all parts of it, the spout not excepted. A brown deposit is soon formed on the inside of the pot if the coffee be allowed to stand in it long, or if it be not often and thoroughly cleansed. An important point, and one often overlooked even by intelligent housekeepers, is that the water should be freshly boiled in a clean kettle. Water, in boiling, loses the air or gases which give it a fresh taste and sparkling appearance. It should be used as soon as boiled, or it becomes flat and tasteless. A brown substance is deposited on the inside of the kettle, and this, if allowed to accumulate, imparts an unpleasant taste to the water; yet there are many housekeepers, exquisitely neat in many ways, who seldom wash the inside of a tea-kettle. It is an excellent plan to keep a small kettle to be used only in boiling water for tea or coffee. Wash and wipe it carefully every time it is used. The proportions of water and coffee are one heaping tablespoonful of ground coffee to one half-pint cupful of boiling water. Reduce the amount of coffee slightly when several cupfuls are required. It takes a larger proportionate amount of both coffee and water to make just enough for one cupful than for more, as the grounds absorb a certain portion of the water, and the last coffee poured out is not as clear as the first. Coffee should be made in such a way that the full strength and aroma may be obtained without developing the tannic acid. To boil, or not to boil? Whether coffee shall be boiled or not will probably be always a question. Many think it has a raw taste if not boiled; others contend that, in boiling, much of the aroma is lost. Boiling makes the mixture roily, and it must stand long enough to let the grounds settle and the liquid become clear. Some albuminous material will help to clear it. Fish skin, isinglass, cold water, and eggs are used for this purpose. Eggs give it a flavor and body, and, no doubt, improve an inferior quality of coffee; but they increase the cost of the beverage, as, aside from their own cost, they clog the grounds, thus making a larger amount of coffee necessary to obtain the desired strength. But if coffee must be boiled, let it be boiled in a closely covered vessel, with a thimble or cork in the spout, as, if left uncovered, the volatile oil which forms the fragrant aroma is dissipated; and it should never boil more than five minutes, as longer boiling extracts the tannic acid. There is a widely prevalent but erroneous notion that long boiling extracts more of the strength and color, and is, therefore, more economical; but strength and color thus gained are obtained at the expense of flavor and wholesomeness. After thorough trial of several methods of making coffee, I have found filtering (or percolation) the simplest, most economical, and most satisfactory. Various modifications of the biggin, or French filter coffee-pot, are in use. This is a double coffee-pot, with one or more strainers in the upper pot. Some of these biggins are expensive, and soon get out of order; but others are very simple, and, with care, will last a long time. The coffee should be ground very fine, and be placed in the upper pot. Some varieties have a convex, coarse strainer in the bottom, to keep the grounds from clogging the fine strainer. Then a coarse strainer is placed over the grounds, the boiling water is poured in, and allowed to drip slowly through the coffee into the lower receptacle. Many of the coffee-pots made on this principle are placed in another vessel containing boiling water; but, if there be only two parts to it, the coffee-pot should stand where the coffee, as it drips through, will keep hot, but will not boil. If the upper part be not large enough to contain all the water desired, it must be poured on in small portions. The full strength and aroma are thus obtained; no clearing is necessary, and, if care be taken to observe all the minor points in the directions, the beverage will invariably be good. For good breakfast coffee, cream, scalded milk, and block sugar are necessary. The milk should be scalding hot, but never boiled, as boiled milk gives an unpleasant flavor. Ascertain the tastes of those at the table, as most coffee drinkers prefer to have the coffee poured on the cream and sugar. One tablespoonful of cream, two of hot milk, and two blocks of sugar, with an extra block in the saucer, is a fair proportion for a breakfast cup. Pour in the coffee until the cup is three-fourths full. Never fill it to overflowing. After-dinner coffee, or black coffee, is made in the same way, a double proportion of coffee being used. It should be very strong, and perfectly clear. Serve it in small cups, with block sugar if desired, but not with cream or milk, as the milk counteracts the purpose for which the coffee is taken. Coffee is stimulating, and, when taken clear and very strong after a hearty meal, aids digestion; but, when combined with cream or milk, a leathery compound is formed, which is indigestible and irritates the internal membranes. Influential Boston cooking teacher and cookbook author, Mary Johnson Bailey Lincoln used Mrs D A Lincoln as her professional name during her husband’s lifetime and in her published works. She was also the first principal of the Boston Cooking School.